Dogs make everything better and this viral video is proof of that. 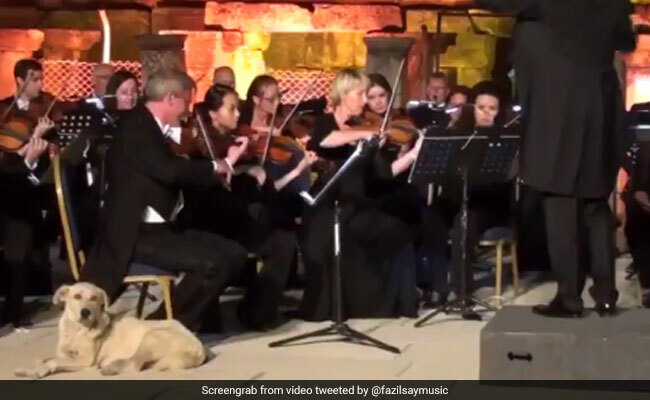 An adorable video that captures the moment a dog wandered onstage as an orchestra played for a live audience in Turkey is currently winning hearts everywhere. It's being dubbed the "cutest moment in classical music" by the Internet. The nearly minute-long video shows the dog slowly make its way onstage as the Vienna Chamber Orchestra plays Felix Mendelssohn's Symphony No. 4 at the International Izmir Festival in Ephesus, Turkey. As the dog proceeds towards the centre of the stage - practically upstaging the musicians - a few stray giggles can be heard in the audience. The conductor briefly turns towards the dog and the audience bursts out in laughter and applause at the comical scene. Moments later, the dog flops at the feet of a violinist, who laughs in delight and continues to play. A thunderous round of applause follows from the audience. The dog's reaction to stealing the show? A giant yawn. Posted to Twitter by Turkish pianist Fazil Say, the video has been retweeted and reposted by different handles thousands of times since Tuesday. Did someone already say Woof-gang Amadeus Mozart? He's just waiting for the conductor to throw the stick. I've said before and I'll say it a billion more times...DOGS RULE!